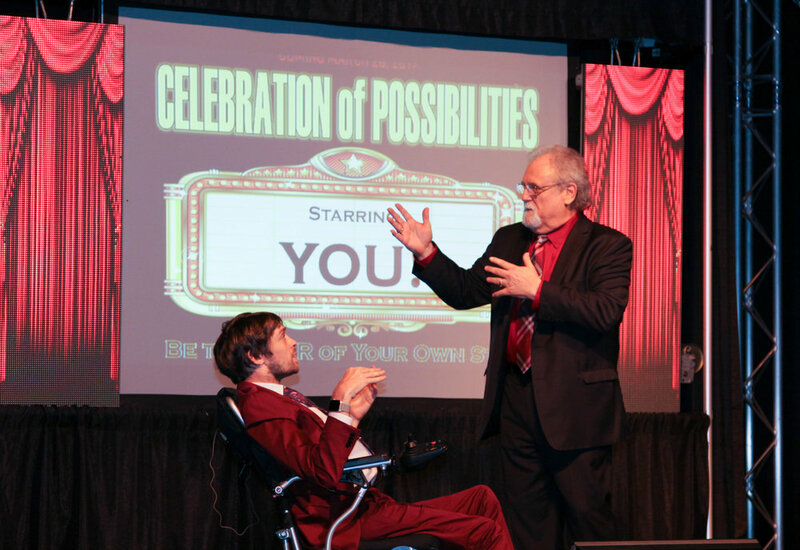 The Eleventh Annual Celebration of Possibilities entertained a sold-out crowd March 28th and focused on the fact that we are all the stars of our own stories. The event showcased people and businesses throughout Fairfield County who best exemplify the Fairfield DD mission —To bring about a vibrant community where people lead fulfilling lives and make meaningful contributions. The evening introduced seven award-winners to the audience, via informative videos, who have had, and continue to make, an impact on the community. As the award-recipients took to the podium to make their acceptance speeches, it was clear many were overcome with emotion. In addition to the awards, patrons of the event were entertained by Comedian Zach Anner as he co-hosted the event with Superintendent John Pekar. Anner, who first performed at the Celebration in 2017, is a celebrated author, writer, YouTube personality and guest star of ABC’s sitcom Speechless. Former Community Relations Manager John Bosser, who passed away in December, received the coveted Legacy Award, which was graciously accepted by his wife Pam and their three children. In addition, Rebecca Nixon was inducted into the Celebration of Possibilities Hall of Fame. Congratulations to all of the award-winners! The 2019 Celebration of Possibilities was a star-filled evening! Click BELOW to watch the entire program. 2018 Celebration of Possibilities Was AMAZING! The Tenth Annual Celebration of Possibilities was quite simply, amazing and, once again, filled the Crossroads Event Center auditorium with more than 425 guests. The event showcased people and businesses throughout Fairfield County who best exemplify the Fairfield DD mission statement—To bring about a vibrant community where people lead fulfilling lives and make meaningful contributions. The evening introduced seven award-winners to the audience, via informative videos, who have had, and continue to make, an impact on the community. In between awards, guests also were treated to a glimpse into the past ten years, along with some comedic moments with a living statue, (Mark Abbati). Unique this year was the presence of dozens of youth at the event. Among the award winners were over 100 teens from Pickerington High School Key Clubs and the football team from Fairfield Christian Academy. Renown celebrity hypnotist Ricky Kalmon entertained the crowd while proving the power every person has to use their mind to achieve their goals. The evening finished with the debut of house band Bad Influence’s music video to their original song, Celebrate Your Soul. The Fairfield County Board of Developmental Disabilities established A Celebration of Possibilities in 2009 as the finale of our month-long celebration of Developmental Disabilities Awareness Month in March. 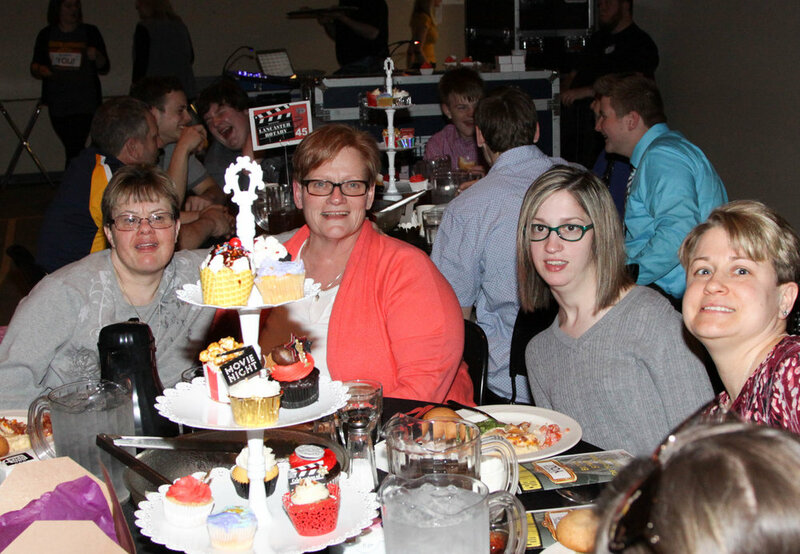 The Celebration of Possibilities, held at the end of March each year, is designed to celebrate and recognize those individuals, businesses and organizations that promote the concept of community inclusion of individuals with developmental disabilities. We in Fairfield County are blessed with those who believe in Fairfield DD's mission: To bring about a vibrant community where people lead fulfilling lives and make meaningful contributions. NOTE: In 2017, Award Categories were dismissed so that more businesses and individuals would be eligible for an award without having to meet specific criteria. This award is presented to an individual served by Fairfield DD who exemplifies the concepts of self-determination through personal, academic or developmental achievement by exceeding the goals he/she has set. The award is dedicated to the memory of Deanna Kirwin, the first person in the state of Ohio to start her own business with a microenterprise grant. This award is presented to a person who regularly volunteers at Fairfield DD and goes above and beyond his or her duties to provide exemplary benefits to the individuals we serve, our staff, and our stakeholders. The award is dedicated to the memory of Goldie Fields, who was a long-time volunteer at Forest Rose School. Her unrelenting spirit and positive attitude was felt at the school until her death in 2008. This award is given to a person or family that has gone above and beyond the norm to help promote awareness or provide services to children or adults with developmental disabilities in Fairfield County. The award is dedicated to the memory of the Hartung family. Beginning in the mid-1950s, Art and Wilma Hartung were instrumental in organizing services for children and adults with developmental disabilities in Fairfield County. Mr. Hartung died in 1971, Mrs. Hartung died in 2008, and their son Tommy passed away in 2009. This award is presented to a staff member from Fairfield DD, a service provider, or a school district within the county who serves individuals with developmental disabilities and embodies our vision and mission, especially when that person's support goes above and beyond the norm to promote the ideals of community acceptance. This award is presented to a Fairfield County business or service organization that embraces the concepts of inclusion and self-determination, and displays that commitment through innovation. This award is presented to an individual who represents a business or service organization in Fairfield County who, through his/her work with that business or organization, does the most to carry out the mission of Fairfield DD through his or her commitment to the individuals we support, Fairfield DD staff, other stakeholders and the Fairfield County Community at large. This award is given to an individual, business, or organization whose actions make a significant difference in the lives of individuals with developmental disabilities and enhance the quality of life in Fairfield County, and who may or may not fit within the descriptors of the other award categories. In 2010, the award was named in honor of the McGhee family, who have always held services to individuals with developmental disabilities close to their hearts, beginning with the late Clark McGhee, an early Fairfield DD Board member, and continuing with his children, Terry McGhee, president and CEO of Westerman Companies, and Sally Grimm, who retired after 31 years as an educational assistant at Forest Rose School. In 2012, we established the Fairfield DD Hall of Fame and honored five distinguished women, each of whom had won awards at previous Celebrations, as our first class of inductees. The Hall of Fame class will be chosen by the awards committee and the Fairfield DD Board, but there won’t necessarily be a Hall of Fame induction each year. Each year the Celebration of Possibilities concludes with a presentation or performance by a special guest. Listed below are those who have honored us with their presence.